I’ve struggled most of my life with looking in the mirror. The woman I see staring back at me has usually not been the same woman I am. The one staring back often feels as though she’s just not good enough. Three years ago, my journey took a new turn. With that turn, part of me was lost, but part of me was also found. I had decisions to make and a path to walk. None of it would be easy. The reflection wasn’t friendly, but what was reflected became bigger than my own reflection. I wear make-up, and I like to wear make-up. My husband and boys tell me I don’t look much different without make-up as compared to what I look like when I do wear it. I disagree. The mirror seems to prefer mascara, eyeliner and lipstick. the camera shows me that I’m squishy, and it’s more than just a few. my heart and my love of adventure don’t agree. The mirror reveals the increase in my graying hair, my stray lip hair and the dark spots here and there from tanning way back when. The mirror is like a friend who is brutally honest…you know…the one who tells you what you need to hear, not necessarily what you want to hear. The mirror shows me what is on the surface, but — if I stay to look long enough — it shows what is often hidden. It was big. I just didn’t know where to put it. Most of the walls in our house are textured, so I just kept saying I didn’t want him to try to put it on a textured wall until I was sure I knew where I wanted it. About a week ago, I told him I finally knew where I’d like it to be placed. When I told him the location, he questioned me multiple times. He was pleased that I had finally made up my mind, but he doubted the wisdom of my decision. Against his own preference, he decided to honor my wish, and he diligently pressed the letters onto the surface for me. We’re both in agreement now. The photo you see above is where it now resides. In our master bathroom, there’s a folding, three-way mirror I designed and made when we renovated the room a few years ago. These wall decals now hang on the middle section of that mirror. They were a perfect fit, and I think they truly were meant to be there. 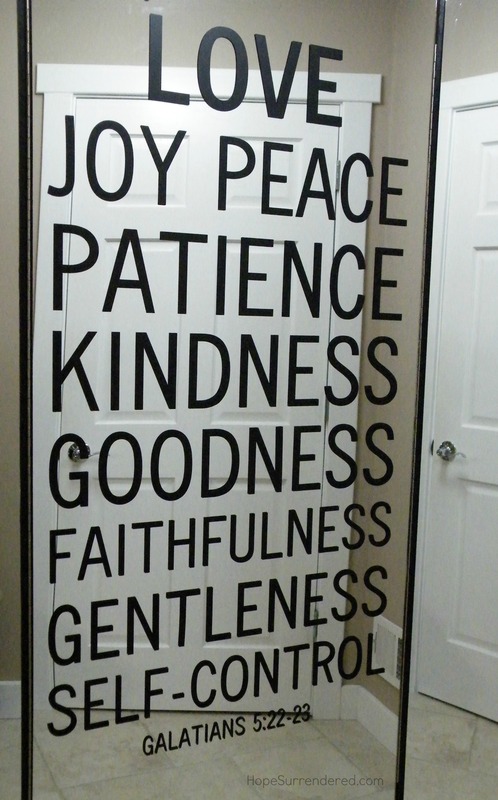 You see, the words now stuck on that mirror are the fruit of the Spirit. When I look into that mirror, what reflects back at me is not just me, but what He is leading me to be as I submit to being in step with the Spirit who resides in me. In Him, through Him, and because of my walk with Him, the woman I see staring back at me is becoming more like what He calls me to be. I’m still a work in progress, but the seeds of His Spirit within me are sprouting and bearing His fruit. I am struggling less with the mirror, as what is reflected is greater than just my own reflection.